PHE, Sanitation, Assam Recruitment 2017- 68 Nos Technical Officer Posts: Last Date 25-05-2017. - Jobs4NE : Jobs in Assam and North East India. PHE, Sanitation, Assam Recruitment 2017- 68 Nos Technical Officer Posts: Last Date 25-05-2017. Applications are invited from eligible candidates to fill up Technical Officer positions under Mission Directorate of Swachh Bharat Mission (Gramin). Last date of receiving application form: 25-05-2017. Name of the post: Technical Officer. Age Limit: As on 01-01-2017, 35 years of age. Scale of Pay: Rs 20000- 25000/- pm. 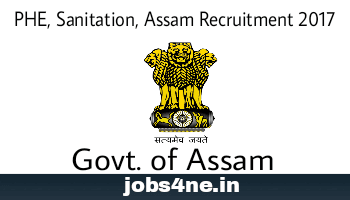 How to Apply: Application in prescribed format along with detailed CV and all relevant self-attested testimonials must reached office of the Chief Engineer (PHE), Sanitation, Hengrabari, Dispur,Guwahati, Assam-36.